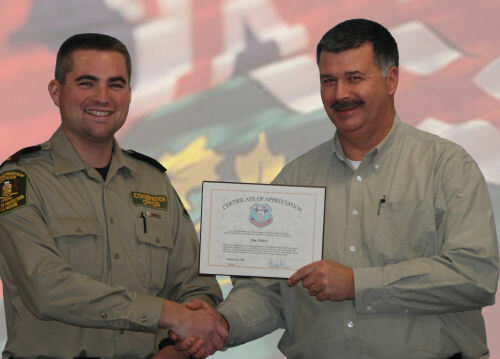 Jim Abbott, Enforcement Supervisor for Timmins Enforcement Unit, was awarded a Plaque of Appreciation from the Ontario Conservation Officers Association at their Annual Convention in Parry Sound, August 2008. It was later presented personally to Jim at the Timmins Enforcement Unit’s December 2008 team meeting. The certificate was to acknowledge the work and commitment that Jim put into promoting the OCOA through merchandising from 1997 to 2007. Many people far and wide exhibit their support for the OCOA by displaying our emblem and slogans on various clothing, memorabilia, and trinkets thanks to Jim’s efforts.